11 Oct : Prime Minister Manmohan Singh on Saturday flagged off the first train service in Kashmir valley, realising the decades old dream of the people in the region through the prestigious project launched in 1998. 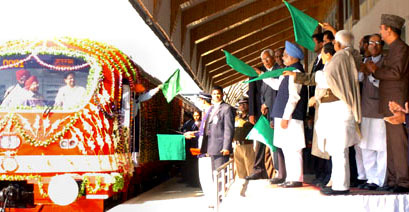 Dr Singh, accompanied by UPA chairperson Sonia Gandhi, Railway Minister Lalu Prasad Yadav and Jammu and Kashmir Governor N N Vohra, flagged off the flower-decked train from Srinagar railway station at Nowgam.The train, which was flagged off 10 years after the project was started by then Prime Minister Inder Kumar Gujral, carried school children.Initially, the train will run from Rajwansher in Budgam district to Anantnag, covering a distance of 66 kms, the spokesman said, adding the fare for the travel will be Rs 15.The regular service of the train will commence from 12th October. There will be an eight-coach DEMU rake in the train, he said. The stoppages will be at Budgam, Srinagar, Pampore, Kakapora, Awantipora, Panjgam, Bijbehara, Rajwansher and Anantnag, the spokesman said.The train, which is expected to cover the 66-km in about 1 hour and 35 minutes including stoppage time at various stations, will be run twice a day from either side. The coaches will have a seating capacity for 90 passengers and the compartment meant for physically challenged persons will have wider doors, the spokesman said.Wide windows of unbreakable and splinter proof poly carbonate sheets have been provided for a panoramic view. Anti-skid flooring and sliding doors have been provided in the coaches and distinctive and attractive colour schemes have been used.Like the state-of-the art Delhi Metro, public information system with display and automatic announcement are included in the coaches. The coaches have executive chair-car type seating arrangement with fire resistant grade upholstery and reclining mechanism.In view of the climate of the valley, 1400 horse power diesel engine for the train has been provided with heating system for quick and trouble free starting in winters. The driver’s cab has heating and defogging unit keeping in view the cold climate.Snow cutting type cattle guard is attached at the driver’s end of the train for snow clearance from tracks during winter. Prime Minister Manmohan Singh had on Friday inaugurated the 450-MW Baglihar hydro electric power project built on river Chenab in Ramban district of Jammu and Kashmir.Union Railway Minister Lalu Prasad Yadav told reporters that the railway project will usher prosperity in Kashmir valley.